Hollywood does not move quickly. It was 2011 when New Line Cinema announced they were working on a movie adaptation of the classic videogame Rampage; in 2015, The Rock was attached to the project; and now in 2018, it's finally seeing the light of day. Although the "star" monster of the movie is George the ape, you know me: I went for the wolf instead. 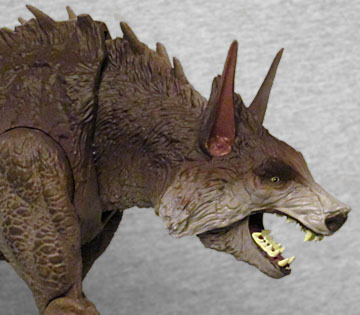 Apparently the movie is going to offer origins for all the monsters (presumably something beyond "exposed to goo, normal creatures got big"), but so far we don't know anything other than "this wolf is somewhat larger than average." In the game(s), Ralph is a mutated human, and so looks very much like a werewolf - bipedal posture, functioning hands, all that. 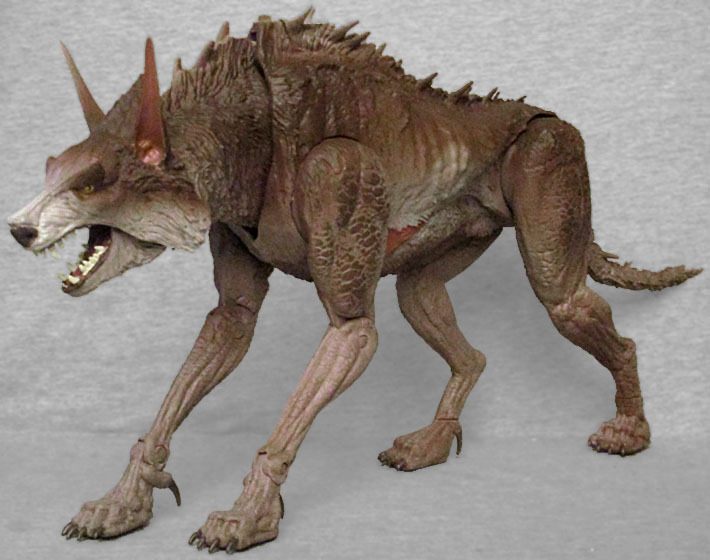 In fact, all the monsters in the game were mutated humans, but the movie is making them mutated animals, so this Ralph is just a big ol' puppy on all fours. It may not be the Godzilla-sized beastie you controlled in the game, but it's still intimidating: the toy measures about 7" tall and more than a foot long - since these are theoretically done in a 3¾" scale, that would make him approximately 12' tall and 20' long. Imagine being out in the real world and seeing a wolf the size of an UPS truck; it may not be giant giant, but it'd still be frickin' scary! This is clearly more than just an oversized animal, however: its fur is restricted to the head, chest and shoulders, with a stripe of it running back along the spine to the scraggly tail. 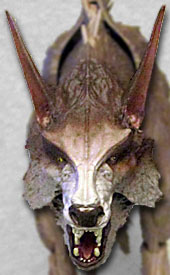 The rest of the body is bald, and the upper legs look scaly. There are spikes jutting out of the fur on his back, and the dewclaws have mutated into gigantic, hooked talons, pointing backwards. The ears are tall and pointy, and the face has a conspicuous line down the center of the snout that absolutely screams "this head is going to split open like the dogs in Resident Evil." So don't be surprised when that happens in the movie. You heard it here first! In the game, George the ape was brown, Ralph was gray, and Lizzie was green; apparently wanting to set itself apart from last year's King Kong, the movie version is making George white. But it's also keeping Ralph a pale gray, so they end up looking alike. The toyline, recognizing that having two identically colored figures on the shelves would be less interesting than three, has turned Ralph brown. Yes, it would have been truer to the series' history if they'd made the ape brown instead, but remember what we said above about George being the star. The paint is fairly good, fading between different shades of tan and brown, and even leaving the snout pale gray. 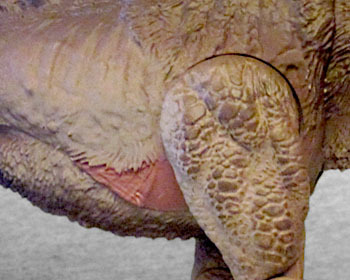 The insides of the ears are pink, and there are large red flaps of skin in his armpits. There's even a drybrushing on the leg-scales to make them stand out. One thing that's weird about Ralph is the proportions. I know that seems like a dumb thing to say about a giant, unnatural, mutant wolf, but it's still meant to be an organic creature, right? To look realistic, the chest needs to be wider. Even skinny little dogs, like Greyhounds and Whippets, still have broad chests because they need to contain all the internal organs. This toy is just too narrow. And it's not even like that was a sacrifice made for space reasons, because there would be plenty of room in the packaging to add, say, 50% more width across the shoulders. I know he's sculpted with visible ribs, but being skinny doesn't make your bones smaller. Ralph has joints in the neck, shoulders, elbows, wrists, hips, and tail. Leaving the back legs (mostly) immobile is a little disappointing, but it does keep the toy stable - the front elbow joints are a little wobbly, and we'd hate to have seen that carried over to the back legs as well. The tail only moves up and down, not side-to-side, and even then it doesn't come up very high. Ralph also has a play feature, where his jaw opens and closes when you move his neck. It's a neat piece of engineering, but the neck doesn't stay in the up position: you lift it, the mouth closes, and it immediately drops back down. The joint there needs to be a little tighter, so you can actually pose it reliably. Since Rampage is all about destroying municipal locations, Ralph comes with a bit of civic scenery to chew up. 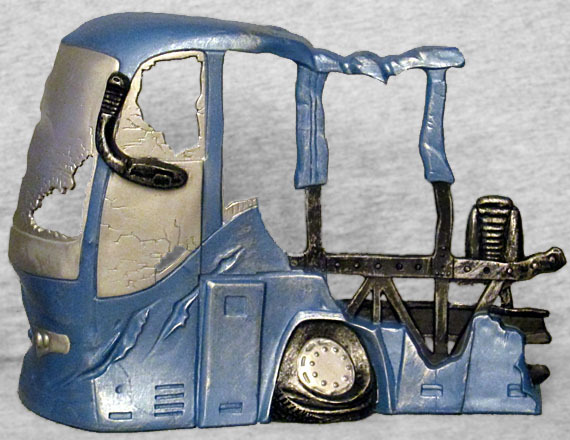 It's the front quadrant of a bus, with the rest having already been ripped away. The body is a metallic blue, and what windows remain are silver. There are huge gouges in the body, and the sole wheel is bent out of place. 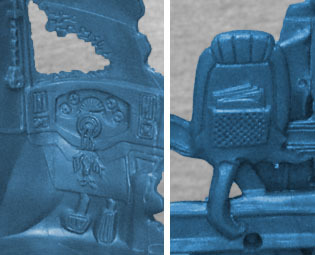 We even get a play feature here, too: a section of the side can be pulled off. It's even sculpted with giant toothmarks, suggesting it's been ripped off with a powerful bite! No, they don't match up with Ralph's fangs, but it's still a cool detail. 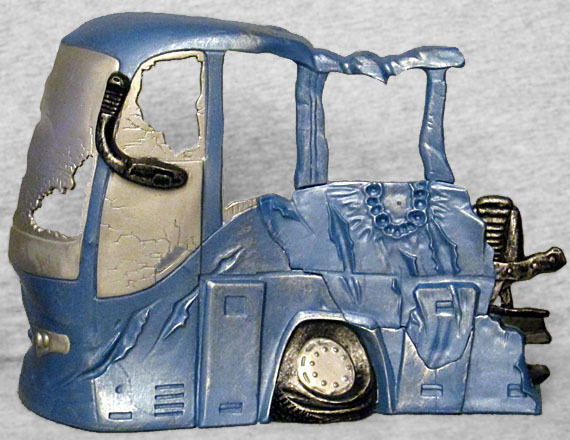 If you turn the bus-part around, you'll see that even the back is fully detailed, including a dashboard, pedals, and radio for the driver, and a seatback pocket full of magazines on the only remaining seat. Are you kidding us? Who would think to include that!? We may not pay any attention to them, and think they only do off-brand GI Joes, but Lanard freaking cares about the toys they make. You can't deny that. 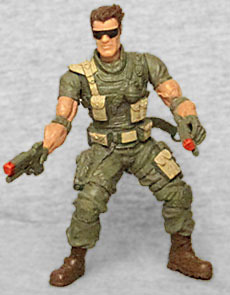 That said, Lanard does make off-brand GI Joes, so this set includes a soldier or mercenary character to be a complete waste of effort against the roaring rage of Ralph. That's not a spoiler or anything, it's just that this figure doesn't represent The Rock (it's a white dude with brown hair, so... I guess it's Nathan Drake?) and he's only armed with a pair of pistols. Non-main character + non-special weapon = you're about to be wolf-chow, fam. Rip Slagcheek, here, only moves at the shoulders and head, but he does have a surprisingly detailed sculpt. Still, this thing is destined to show up in a bin of loose dollar toys at some flea market 10 years from now, with nobody remembering what he is. The pistols are separate pieces though, so don't expect to find them with him in that bin. Or be prepared to dig to the bottom. Ralph may have lent his name to a Disney character, but he got his name from a Looney Tunes character - Ralph the Wolf, Sam the Sheepdog, remember? And back in 2009, Warner Bros. bought Midway games, the company that owned Rampage, bringing the name back home where it belongs. Clearly I wish the movie were going with the big six-story tall werewolf, but like Rustin always says, what're ya gonna do? There's a little room for improvement here in both the sculpt and the articulation, this is a big awesome monster toy for just $15.